1. Trim the edges of the images and scrapbook paper to fit inside the belt buckle blank (the well portion). 2. Decide on placement and glue stick the images in place. 3. Use jewel glue and glue rhinestones in a decorative pattern. You could glue around the entire edge or just highlight a certain area. 4. 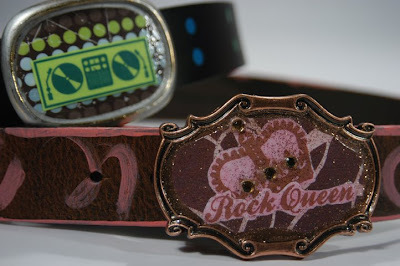 Add Dimensional Magic to the belt buckle by gently squeezing the glaze over the images and rhinestones. Be careful to keep the glaze in the well of the belt buckle. If you get an air bubble the use the end of a sewing pin to pop it. Allow to dry overnight or longer if needed. 5. Apply the leather paints to the belt. 6. Attach to a leather belt. These are fab! Especially the Rock Queen one! Cathie I love this! I watched you make these on Creative Juice the other day. I was looking for Dimensional Magic at Michaels and could not find it or they were out. Instead, I bought Paper Glaze by Aleen. I hope that it works the same way. It claims to...any thoughts? Where do you get your belt buckles from? 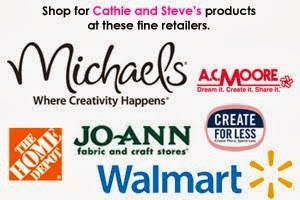 this is very cool Cathie! I hope you were wearing it at CHA! p.s doesn't Plaid sell the buckles? Been looking for the silver buckle forever! Where can I get them? ?